The Meghalaya Government has raised the issues related to funding by the Centre under Smart Cities Mission and funding under the 15th Finance Commission for the State. 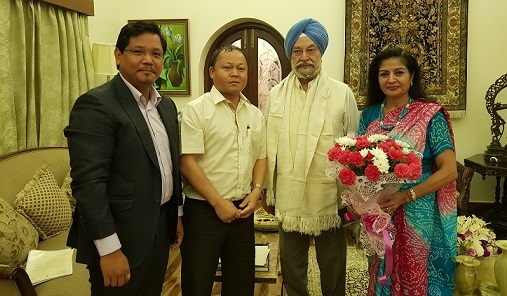 The issues were raised by Meghalaya Chief Minister Conrad K Sangma along with State Urban Development Minister Hamletson Dohling when they called on Union Minister of State Housing and Urban Affairs Hardeep Singh Puri at New Delhi on Monday. “In the meeting, a number of issues were discussed with regards to funding under Smart Cities Mission for Meghalaya, issues of funding under the 15th Finance Commission, pending release under 10 per cent lump sum and additional fund allocation for construction of Laitumkhrah and Polo Market in Shillong,” a statement issued by the Chief Minister’s Office said. The statement said that Singh was very positive to all concerns raised, and assured full support and cooperation to improve urban facilities and amenities in Meghalaya. At present, the funding pattern for projects under Smart Cities Mission is on a 50:50 basis between the Centre and a state. The Meghalaya government has pleaded to the Centre for reasonable funding pattern especially when various centrally-sponsored schemes have been structured on the basis of 90:10 between the Centre and the State.